My family spent the Thanksgiving holiday at Great Wolf Lodge in Grapevine, TX, just a stone’s throw from DFW. My older son and I spent each afternoon at Founder’s Plaza, the official observation spot for the airport. Unfortunately, the wind was coming out of the North, so landings were on the far end of the runway, and the takeoffs on the close runway were almost entirely American A321s. 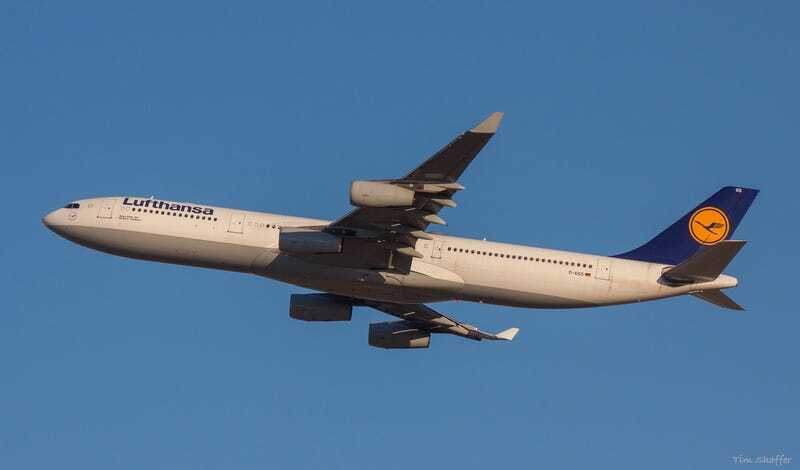 My son, who had been scanning FlightRadar24, knew that this Lufthansa A340 was going to be leaving soon, and I got to chatting with another plane spotter who told us of an unofficial spot on the other side of the terminal. So we loaded up and boogied over, just in time to watch this A340 take off for Frankfurt. I had never seen an A340 before, so this was pretty exciting. I’ll have some other photos from the days of spotting when I get more time to edit.